Hi. This is just an update to note about a year ago (I can't believe it's already been that long) my close friend started a dedicated forum about the Legendary Starfy series. This attracted a relatively large number of members, although activity has sadly died down. If anyone wants to discuss Legendary Starfy it may be a good place to chat there at http://thelegendarystarfy.boards.net/ if you like. Thanks. I started an appeal and petition for the character Starfy. Through this medium; we can educate other people about what makes him unique, spread his support and encourage a few people into voting. Contrary to some belief, he is not a 'weak' character with limited options for moves. His adventures throughout his five games support the idea that is far from the case. I stress that I only intend to encourage votes from the official ballot. I do not want people messaging Masahiro Sakurai on Twitter or anything like that. Tose (or TOSE) is a company who has contributed to a huge number of games, often for 'minor' things, and not taking credit. They are known for being "behind the scenes" . Confidentiality agreements have meant that they often do not disclose whether they worked on a game. However, they own part of the copyright to the Legendary Starfy series with Nintendo, and have developed those games. Densetsu no Starfy began when Hitoshi Yamagami received an instruction from his boss to make some kind of 'floaty platformer' in November 1995. This game became a balloon-lifting game, then a game where the player had to control a bubble with a Nintendo character in it, then Densetsu no Starfy for the Game Boy Color before being reworked to the Game Boy Advance. To make Densetsu no Starfy, Hitoshi Yamagami collaborated with Tose producer Yasuhiro Minamimoto and we can see in the Densetsu no Starfy staff credits that Tose were involved in developing it with supervision from Nintendo. The Big Starfy stuffed toy made by Tomy can be can be seen on the coordinator icon for the job type (or "job family") page. When discussing The Legendary Starfy coming out of Japan, Hitsohi Yamagami has described the game like "his own child" making a major debut. I feel the development team really enjoy what they made. As part of the Starfy Wiki Tose article, I gathered different logos that Tose used on their website throughout the years. I like the rainbow one personally. When I saw Peach's up air attack in Super Smash Bros. 4, it made me think of it due to Tose developing Super Princess Peach, even though I really have doubts that is relevant. If you look at their website during 2003 (and maybe they had this up earlier) then you can find this section advertising Densetsu no Starfy with a nice slot machine flash thing where characters from Densetsu no Starfy are shown! These characters are Starfy, Moe, Herman, Ogura's final boss form, Konk, Old Man Lobber, an Ukizzu, Konk and Blantern with the Buranko. The characters on the panel constantly change and occasionally you get three matches. A really nice touch is that Tose added animations to the sprites, making them shine/Moe's eyes move around, etc. From 1998, Tose started a series of surveys on their website called The Invention King or TOSE Invention King, where they would talk about inventions, ask for people's ideas/opinions and give prizes for select responses. The first "The Invention King" was for software ideas for a Playstation and Dreamcast "PDA". The prizes were originally plain cash up to 100000 yen (about 839.38 dollars according to the conversion tool offered on Google). The series went on and the prizes decreased in value, though. Some time later QUO Cards worth 1000 yen (and of an unspecified value during the 12th The Invention King) were offered as prizes. Densetsu no Starfy merchandise used to be offered as prizes as well. These included a copy of Densetsu no Starfy for a 2002 mobile phone survey and Showa Note's Densetsu no Starfy soft pencil case for a December 10th 2002-Februrary 28th 2003 survey. From July 15th 2003-September 30th 2003 to April 15th-June 30th 2004, Tose continued to offer "Densetsu no Starfy goods" as prizes in their Invention King surveys but they didn't specify which goods they were. As is well sourced, Super Princess Peach was developed by Tose, though Nintendo solely owns the rights to the game, scenario, music and program. 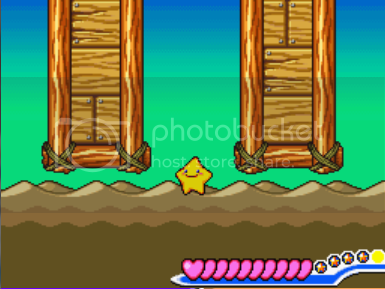 Starfy cameos in that game as an enemy name as the "Starfish" (however, Starfy is actually described as a mysterious star like creature with traits of a celestial star by Hitoshi Yamagami). In that game Starfy is wearing sunglasses. In the Legendary Starfy series, Starfy likes wearing, and collecting sunglasses. He is a rare enemy in Super Princess Peach that appears in three areas of Hoo's Wood, Wavy Beach and Gleaming Glacier and when you defeat him in all three locations (with him no longer appearing after he is defeated there), he appears in the Glossary as "a star-shaped foe rumored to be the prince of a kingdom? ; a reference to Starfy being the prince of Pufftop. Here is a video of defeating Starfy all three locations. 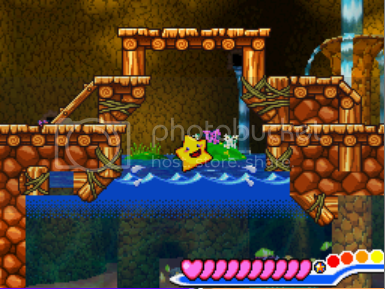 Super Princess Peach has some other similarities to the Legendary Starfy games as well. There are fragile platforms in Shriek Mansion, Fury Volcano and Bowser's Villa and these are like the fragile platforms in Misty Town in Tose's then previous Starfy game, Densetsu no Starfy 3. Another similarity is that there is a stage called Bowser's Villa. In Densetsu no Starfy 4 (a later game), the first Stage is called Lobber's Villa (actually Rob's Villa if we use the Japanese name of Old Man Lobber). 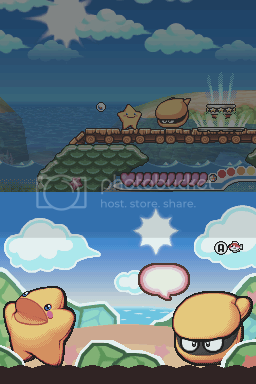 Super Princess Peach and the Legendary Starfy games share some similar options, including Bonus (like Densetsu no Starfy's Omake option), Glossary (like the 'zukan' features), Minigame, Music Room and Shop. Within the game code, we can find more things in common. The Japanese version of Super Princess Peach and Densetsu no Starfy 4 share a large amount of unused models. Some of these are Starfy series related, so if we rewound time and someone discovered these (assuming no one had), then one could assume that a 3D Starfy game was in the works. From these unused models, it makes me wonder if Tose have unused stored assets in more Nintendo DS games. It is worth stressing a lot is that although Densetsu no Starfy 4 uses some 3D models, they are only used for stage previews and the Game Over screen and possibly other things. The game is not in full 3D. Super Princess Peach uses even fewer if any 3D models. Densetsu no Starfy 4 has the shared data between Super Princess Peach for the Koopaling bosses that didn't make it into Super Princess Peach. Apparently, in one of three "bmg" files in Dr. Mario & Puzzle League there is text from the Legendary Starfy games, which I deduced to have been copied over from Densetsu no Starfy 3. Some of the text clearly refers to debug leftovers from Densetsu no Starfy 3 (and maybe we can still access a debug menu there). This includes test messages and text for testing functions (including color change testing, animation change testing and conversation testing). I discovered how to activate a debug menu in Densetsu no Starfy after somebody from TCRF found debug text in the ROM where you can do various things like listening to all music (though Densetsu no Starfy does have an accessible sound test) and forcing a conversation. The debug sound test lets you listen to sound effects and an unused version of the Opening Demo music unlike the accessible sound test. The accessible sound tests are known throughout the series as Umi no Neiro (which you could translate as "Ocean Tones" or Sea Jams if you go by the localized The Legendary Starfy name). The style of this debug menu is shared between debug screens for Game & Watch Gallery 4 and Dan Doh!! Tobase Shouri no Smile Shot!! (suggesting that Tose may have had a role in the development of that game). Both Dan Doh!! Tobase Shouri no Smile Shot!! and Densetsu no Starfy have screens called the "Debug "Main Menu"". I wanted to make a new page on NintendoWiki that included new external links, so I get the Captcha, but whenever I select all the pictures of cats and submit the page it doesn't work as if I got it wrong. It isn't the wrong interface text either, as selecting all the pictures of dogs causes the same problem. I've got around the problem somewhat by adding <!-- --> to references but that means you can't see them. Here are references to The Legendary Starfy in Nintendo Power. This includes one scan of a page of an interview with Hitoshi Yamagami I could only find the first/second page of. I don't have scans from Volume 259 though, which apparently shows someone's fan Starfy plush. I live in the UK, so it's a shame we never got anything like this in ONM. Following some recently found unused maps and other unused content from Super Princess Peach found by "Ragey". (i.e. 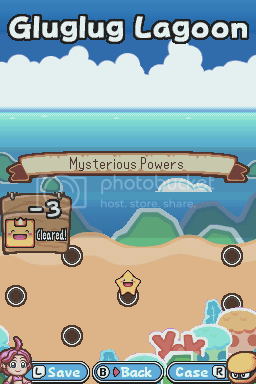 another game co-developed by Nintendo and TOSE which has a secret "Starfish" enemy which is Starfy wearing sunglasses) I decided to look at The Legendary Starfy's engine to see if its level maps were stored the same. Sure enough, like Super Princess Peach, the next levels have an index number +256 (giving room for up to 256 rooms per valid level if the developers make space for it) and the equivalent level belonging to the next world is +65535. I've found a number of test rooms, some with relatively small index numbers, belonging to a World 0 (it appears as a space). You can find a gallery of all of them I've found so far here. It's looks like a stage used to test Starly's Low Spin and Wall Jump abilities. There are a number of large rooms like these (all with low index numbers), for example one of them has a giant platform with a pool for Starly to Wall Jump to. Another one of these rooms is full of just empty space. There is another which only contains water with a strong current to knock Starfy or Starly back. It's a stage with Lobber's Cottage background from Densetsu no Starfy 4! It looks a little glitchy from the ground. There were three Pearls in this screenshot before I collected them. Another one of these stages, using a background from Densetsu no Starfy 4's Pulling Ahead Lake. 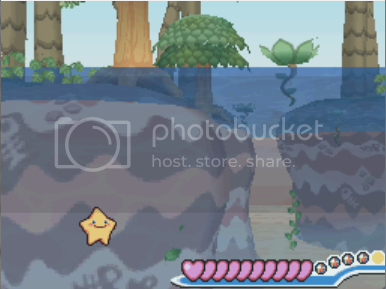 It's a large room with a giant pool of water for Starfy or Starly to swim in. There also seems to be an invisible staircase of some sort which you can walk on. It's a copy of the last room in Gluglug Lagoon (1-1) set in 'World 0'. When you approach Moe, an empty speech bubble is shown. Exiting the level brings you to the World 0 map above. This one is in "0-4". I didn't want to post any more on this thread as it would extend the page. I plan on looking for unused maps in Densetsu no Starfy 4, but there are no save files on the Internet, and I don't know how to upload my own. It is difficult to find the addresses because you can only select stages and worlds freely once you complete the main game at least once. Nintendo Gaming / "Devil Training" - Brain Age sequel. Revealed at this year's Nintendo Direct conference (Feb 22, 2012), was another entry to the Brain Age series, this time for the Nintendo 3DS which is going to be considerably harder, with an emphasis on "memory" and "concentration". It hasn't been given a name yet, other than the tentative title "Oni Tore" which can translate to "Devil Training" or "Demon Training". I've heard it's going to be released in Japan Summer 2012. I wonder if this will actually make it outside of Japan. I personally hope other branches of Nintendo don't take the reference too seriously. Edit: Removing kanji/kana, because boards render them as question marks. Recently, The Legendary Starfy section on Spriters' Resource was updated with sprites for unused transformations in game. Notably, there seem to be unused mermaid and frog transformations which would probably explain they exist as costumes in Stuff. More strangely though, there's an unused cockroach transformation, I wonder what happened to it? Nintendo Gaming / "Massively Single-Playing Online RPG"
Even though this is old news now, I thought it would be interesting to discuss, with Dragon Quest X Online for Wii and Wii U coming up soon. About a month ago, Nintendo published a patent for a "Massively Single-Playing Online RPG" which they apparently filed in early 2010, with the idea of a "persistent world for players to explore" but with none of the interaction. The process was "A method and apparatus that allows a player to play a massively single-player online game without directly interacting with other players, while affecting and being affected by other players playing the online game." It would be interesting to see an 'online Records Room' service for Pokémon, or a changing in-game economy. In one example, Nintendo said that "one player could find a pile of building materials and would build a house." and that "the next player would not find those materials, but a finished house". Metroid / Happy 25th anniversary Metroid! Today (06 August 2011) happens to mark the 25th anniversary of Metroid for the Famicom. People at ROMhacking.net finally finished translating For the Frog the Bell Tolls, a game about frogs and snakes and princes... It's the precursor to The Legend of Zelda: Link's Awakening's engine for those who don't know, where Richard appears as a character in the game. It was rather primitive, there were automatic combat scenes with the same results in which sometimes you'd need a particular item or power-up in order to win. Another game like this was Tomato Adventure, which was an action-command RPG which was supposedly the precursor to Mario & Luigi: Superstar Saga's engine. Apparently, the Hermie III boss is actually based upon the 'Hermie' enemies in Tomato Adventure who were also decorated hermit crabs. There's even some unused music in M&L SS based on Tomato Adventure (and possibly the canceled GBC game Gimmick Land)'s title screen. Basically, you click the random article link on the NIWA network website five times and then make a short story with whatever comes up. You don't have to continue the story and can simply start a new one. Andross found Kirby using his Cupid copy ability. Andross dodged Kirby's attacks and grabbed him, which made him lose his ability. Kirby then threw a Coconut inside of Andross' mouth. Andross flees whilst Saria's Song is playing in the background with Save Frogs dancing to the song.